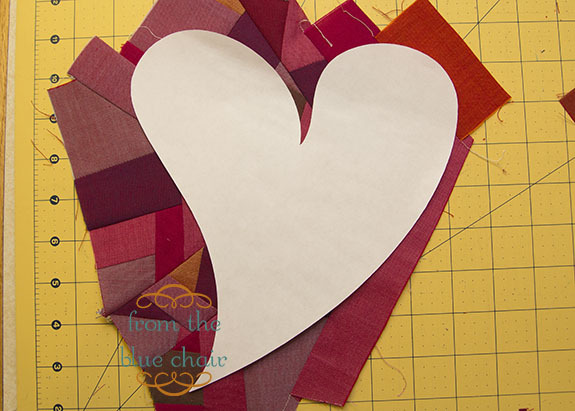 I was excited when Jennifer contacted me to participate in her Spread the Love Valentines Blog Hop. It gave me the motivation to actually make this pillow I've had in mind for a while. I'm not terribly into cutesy Valentines Day decor. I'm not against it; it's just not my style. I did want to make something fun for Valentines that wasn't over the top cutesy. I hung onto every tiny scrap of the Oakshott Cottons I received last year, and have been saving them for a fun, small project. They were perfect for this pillow. First, draw your heart (or any shape you want). I wanted mine to fill only the lower quarter of my pillow so I went fairly small. Start piecing those scraps together. 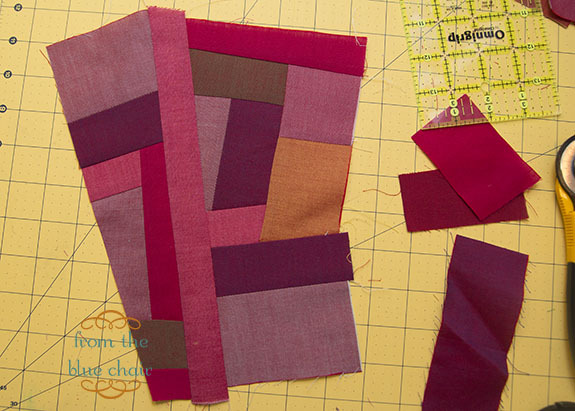 When I'm improv piecing, I tend to begin by sewing smaller pieces together to make strips or sections. I then sew those together with the larger scraps. Don't overthink it. Just have fun. Keep adding to your improv block until it's about a 1/2" larger than your shape, all the way around. 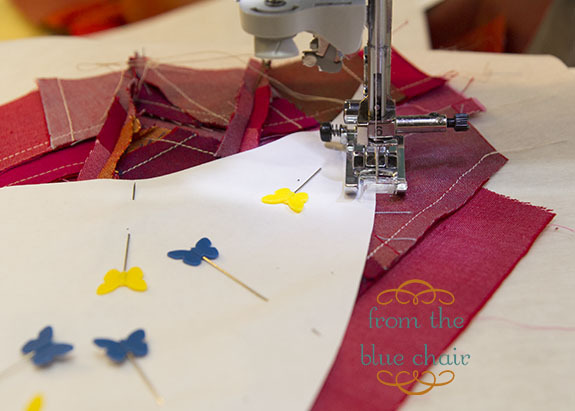 Attach the interfacing to the back of your linen squares as well as the back of your pieced block. (I forgot to attach my interfacing until I had already sewn my block down so the pictures don't reflect this). Decide how to position your shape on the pillow. Now layer all the pieces. Each piece will be right side down. First place the linen square, then pieced block, then paper shape. Pin all layers together well. Carefully stitch around the shape on the back. Before stitching, use the top thread to pull the bobbin thread up through your fabric to the top. Hold both threads out of the way and begin stitching. This will prevent a bird's nest from forming on the front of the pillow. Trim the excess. I left about 3/8" - 1/2" around my stitching. Very carefully separate the two layers and begin cutting out the linen inside the stitching lines. I choose to sew two stitching lines to add strength. Now make your pillow by inserting the invisible zipper and sewing around the perimeter of the pillow. Check out The Busy Bean for a tutorial on invisible zippers if you haven't done one before. It's my favorite way to finish off a pillow cover. Our giveaway today comes from Our Epoch Fabric Shop. Andi is generously giving away a Jelly Roll of Comma by Zen Chic, two Mini Charm Packs (Candies) of Posey by Aneela Hoey, and a 10 pack of Clover Wonder Clips! I wish I could win. To enter, just leave a comment. Please make sure I have your email address (in your profile or the comment) if you want to win. Don't forget to check out all the other tutorials and giveaways that happened this week! I like your pillow. Is this the porthole technique? Will the linen ravel nicely? I love the subtlety of this, thanks for sharing the tutorial. Just the perfect amount of Valentine cute! I have never done reverse applique, so it's something i could try! Thanks for the giveaway! Thanks so much for this tutorial. I'm thinking about all the cool shapes I can put on pillows now! So cute Kati! I love your modern take on a patchwork heart. Thanks so much for being part of the hop! That is such a great pillow - and a great giveaway. I love the shape of your heart. What a great tutorial! I love everything about this pillow. Thanks for the giveaway! I love the improv piecing in the heart. Thanks for the tutorial and the link to the invisible zipper too. That's what I do With my scraps! I have them dryer by color family, and when the baggie gets too full, I start stitching and slashing until I have a useable size piece and make something with it! I've never tried reverse appliqué, but this I might have to do. Thank you for sharing! This is just perfect for Valentine's Day. Such a clever technique. Thank you for sharing with all of your followers. WOW is all I can say about the giveaway. Just think of all the endless possibilities using all of these goodies. Good be quilting for a long time. When you're poor, this amount of fabric just seems like the ideal gift. Very pretty! Thanks for the tutorial. 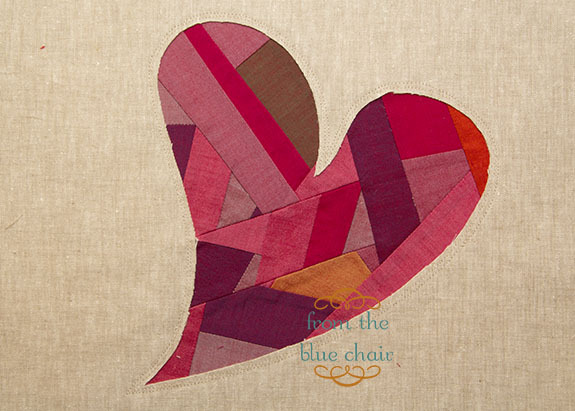 Love this patchwork heart. Thanks for sharing. this is so sweet-- you could leave it out all year-- my daughter would love one for her room! I love your pillow! I might have to make one of these... Happy Valentines Day! Your pillow is just so lovely and sophisticated too. I love it. I love this - the heart is just perfect and the colours look great! Thanks for the lovely giveaway. Oh thanks I so want to make one of these!!!! So pretty! And thanks for the giveaway! I love this cushion!! not too 'cutesy'!! This turned out awesome! Thanks for the tutorial! your cushion is gorgeous! Love it! I'd love some of those wonder clips! This is so very pretty! please count me in for this generous giveaway. Cute pillow! I like the heart shape and the colors. I love it and your color choices. I think I'll be whipping up one of these this weekend! Wow! I love this idea. I am not a fan of cutesy valentine decor either, but this is nice and subtle. Love the generous giveaway too! I so love this pillow! What a great project! I will for sure be trying this one out! Thanks so much!!!! I have a question - will the fabric only fray back to the stitching line? You don't have to zig-zag it? I love that technique. Must give it a try. Thanks for sharing. I have to agree. I am not to into cutesy decorations either, and this pillow is perfect. Love it! LOVEly pillow! It's a new technic for me, thank you for the tutorial. Really *love* this one. Great heart shape and a fun technique. Awesome giveaway, and love the understated pillow and instructions! That is just so cute. It gives me ideas for some other projects, too. Thanks for the great inspiration! LOVE the pillow! I might try this technique as soon as I finish my current UFO! Darling pillow! 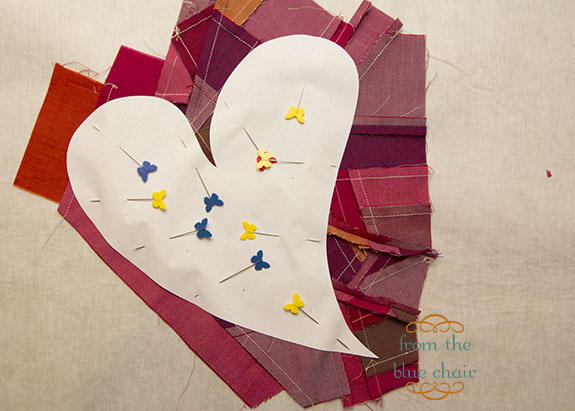 And what a great way to make a patchwork heart! And really that method could be used for just about any applique object. Thanks so much for the idea. And thanks to you & the sponsors for a great giveaway. 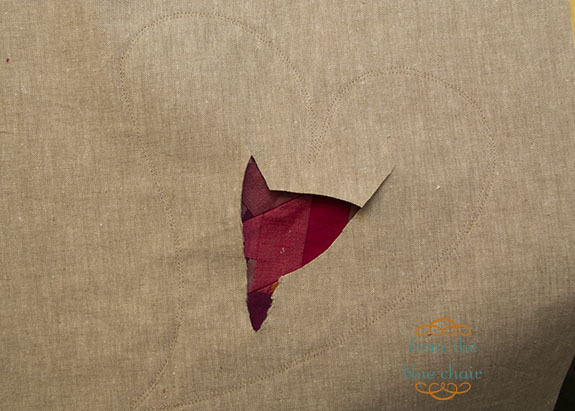 The pieced heart on your pillow looks really cool! Love how you incorporated the improv piecing. Pretty and a little understated! Love this tutorial! I have been wanting to try reverse applique. This would be the perfect project. Thanks for the tutorial and the wonderful giveaway. that is a very neat tutorial. I really like the scrappy heart! awesome pillow, I love that it has the Valentine theme but isn't too over the top. Great job!!!! this is such a wonderful idea. Thanks so much for sharing your tutorial. This is really cute! I like how it's for Valentine's without being over the top. I love the patchwork wonky heart! Really cute pillow - thanks for the great tutorial & the chance to win. I love your pillow! I think it is perfect for Valentine's. Thank your for the chance to win a fabulous prize! This blog hop has been really fun. Thanks. wow, great giveaway and cute pillow Thanks! I've never tried reverse applique before, but I like this cushion so much, now may be the time. Thanks for the great tutorial--and the great giveaway opportunity. How cute! I love seeing reverse applique in action. I've tried it before, but never really know when to use it, as opposed to regular applique. I really like your pillow. It's perfect. Great tutorial and a wonderful way to use up small scraps, I so need some wonder clips, I hope I win! Love the pillow! Thanks for the giveaway. Thanks for the clear tutorial, I really need to try this technique! Kati, this is adorable (but not toooo cutesy!). Love it, especially in the oakshotts. I love your pillow! I'm not into cutesy either, so this really fits the bill. Thanks! I love this! The improv piecing makes it so unique! This is gorgeous! The scrappy - but cohesive - look to the heart is perfect, especially since you picked such a great texture for your background. It keeps this pilow from being flat. Instead, it's warm and rich! Love it! What a great project - I have not done reverse applique yet and you are tempting me!!! Wow, I am not big on V day decor either, but this is the second thing on this blog hop that has me rethinking the idea, so pretty! What a great way to use your favorite scraps! Adorable. 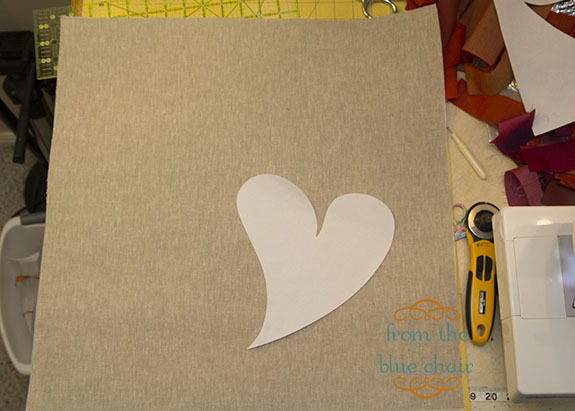 I love the reverse applique heart. This one is going on pinterest for me try sometime. Thanks for sharing! Beautiful Pillow! I love that it is simple, perfect for my daughter in laws decor. Thanks for the great tutorial. Oh, thanks so much for offering a giveaway! I LOVE the wonder clips! AND Jelly rolls!! YEAH! I hope I get to be the new owner of some!!! Your pillow is beautiful and wow what a giveaway! This is so pretty! The Oakshotts give it such a nice touch, I can see why you kept every scrap! That is absolutely my style! I love it!! You can see the quality fabric through the computer screen! PLUS, I've been wanting to try a hidden zipper pillow cover, I usually do the overlapped opening in the back. THANK YOU!! LOVE this and thank you for the giveaway! Very cute pillow and you make it look so easy. That is such a pretty pillow. I don't like cutesy Valentine decor so I think this is perfect as a holiday accent. I love this. I especially love the shape of the heart and that it is in the corner. That makes it pretty classy. I WILL do this one someday. So hard to choose v-day craft projects this year. Thank you! Thanks for the tutorial. I love the pillow. Cute pillow! Thanks for the tutorial. Love the look of the heart. I like scrappy looking projects. I love the look of the pillow with the linen. This is absolutely adorable.. gonna go improvit! Love Comma and I've been meaning to get some of those wonder clips! I have never tried reverse applique, but it looks great! Love the tutorial. I have done some reverse applique and thing that it is quite unique. Thanks for including me in your giveaway. I love the pillow! It's not cutsy. It's both subtle and fun at the same time. Thanks for the giveaway! I love your pillow. Cutsey isn't really my style either. I wish I had some leftover Oakshott's. I love that little heart on the pillow. That is all I would want on my couch for V Day. Great tute too. Thanks for a chance to win the blog candy!! I really like your idea, because I'm not into the cutesy stuff either. I could see this idea being used for other holidays (i.e., Fourth of July, Halloween) too. I love how the pillow is elegant instead of cutesy. It's beautiful! This is a great idea to use up scraps. I'm afraid to tell you I'm pretty ruthless, anything small either becomes 2.5 inch squares or strips 1-2 inches wide. Anything smaller than that goes in the trash. Such a nice pillow--not too "Valentine-y" for grown up tastes. Thanks for the tutorial and the giveaway. I love your reverse applique method. It inspires me to try one too. So pretty! I definitely want to try a pillow like this! Thanks for a great tutorial and a gorgeous project. It doesn't scream Valentine's Day. Very elegant - I'm bookmarking it! Many thanks! First I adore your project. Just the right amount of cutesy and mix with a food dollop of grownup ness. Also Oakshot anywhere is bound to be a winner. But second, thanks for sharing this technique. I am trying to some reverse appliqué and am finding it really fiddely and difficult and annoying. But your method looks much more practical. I'll be trying this soon. Love the pillow and the method seems pretty easy, especially for a beginner like me. I see lots of new pillows in my future! I have to agree, I'm not into cutesy holiday decor or decorating because there's an event (like valentine's day) but your pillow is fabulous! Love the shape of the heart and the Oakshotts were a perfect choice. Beautiful! I have never seen how reverse applique worked - great tutorial. And those clover clips!!!! I recently bought a box of them and don't know how I ever lived without them. Great giveaway - my fingers are crossed. Your pillow is so lovely. Love this heart design and tute. Beautiful and modern! Thanks for sharing! Adorable pillow. Thanks for sharing. 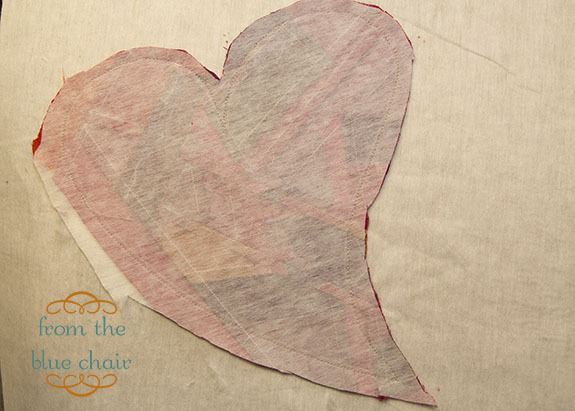 I love that sassy heart shape and I agree, it's a great use of those precious Oakshott scraps! What a killer giveaway, too. Thanks! Maybe reverse applique isn't as scary as I thought! I should give it a try! Thank you for the chance to win, what fun :). Loving the scrapiness of the heart, perfect touch! I hope I win too; that's a wonderful giveaway. And I love your pillow. It's just right. Thank you. I love that pillow. It's so cute. very cool pillow! it would work with any shape and color! thanks for the inspiration! So cute! How fun to have seasonal pillows! The pillow us begging to be hugged!! !The heart is so cute. Ohhhh thank you for the great decor idea! What a perfect Valentine pillow! I don't really do cutesie either so I love to see "grown-up" Valentine projects. So cute, I've always wanted to try reverse applique, and the patchwork is adorable! Thanks so much for sharing! I've never tried reverse applique, but this makes it seem so easy to do! Thank you! I would so love to win. Thanks for the tutorial!!! I love how your heart is scrappy and the shape of it. Thanks for the chance to win. 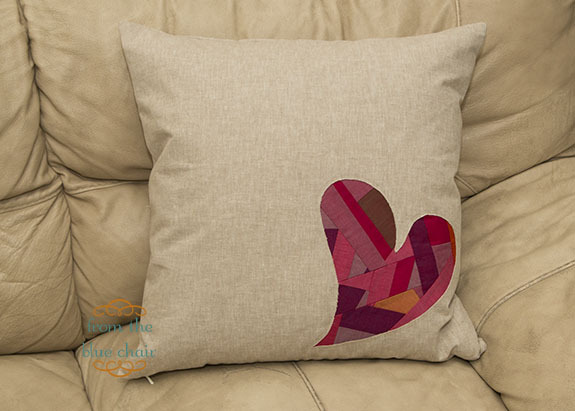 I love your pillow with its charming patchwork heart! I love that pillow!! How sweet! Love the pillow!!! I need to make this next year! Those oakshott cottons look so beautiful. Simple and quite elegant! the giveaway sounds awesome. I love your reds, grear color choices. Very cute, makes me wish for a day off to get some sewing done! What a beautiful pillow. Thanks for the chance to win an amazing giveaway. You did a great job - understated and classy. Classic! Love the pillow - I'm not a fan of cutsie Valentine's either so this is perfect! Nice tutorial - thanks! I love your heart pattern! This is so simple and so pretty, I could totally see leaving this out year round! I love this pillow! Adorable kati! You make this look so simple! Thanks for the tutorial. Cute pillow, I have been meaning to make some new ones for my sofa! I like that your pillow is 'not in your face Valentine'. It's very subdue! This is a lovely tutorial! I like the shape of the heart. Gotta love those Oakshot cottons in a gorgeous scrappy heart! Thanks for the chance to win! What a sweet design! Love it's mod shape. Well done tutorial and a great giveaway to boot. Thanks! Love the pillow - simple yet adorable. Can't wait to make a few for my home. Cute pillow! Thanks for sharing the tutorial. Cute pillow! I love improv piecing. And great technique! Thanks so much for this tutorial. I've always wondered about reverse applique. Love this pillow, the background is perfect. And what a wonderful giveaway. Great pillow! Thank you for the giveaway! That pillow is darling, love how you've pieced the heart. Thanks for the giveaway! Beautiful pillow! Thanks for the chance!